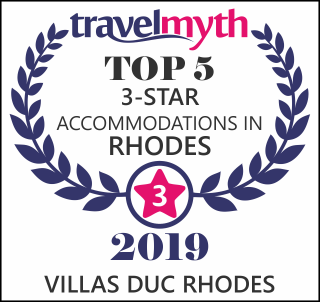 Villas Duc - Rhodes !! Our hotel offers accommodation in a friendly and warm environment. Our purpose is to make you relax from your daily routine by feeling the Traditional Greek hospitality. Loosen up by enjoying the Greek summer and it's sunshine inside of a seductive aroma of the lush garden. Take some of your time to treat your body and soul by spoiling yourself with a mediterranean massage or a beauty treatment. Be sure to try one of the fantastic summer cocktails served at our bar and of course don't skip the unique creations of our restaurant with not only Greek tastes but also offering more International flavors. After a day of discovering all the wonders that the island offers you, give yourself a rest in our fully equipped and cozy apartments by experiencing one of the most beautiful sunsets. Villas Duc Rhodes welcomes you to the hotel and to our "Family" . A perfect choice for a family of four persons ! Two bedroom apartment for families with Sea & Pool view. A perfect room for a couple with a beautiful sunset !! A double room with Queen size bed for two persons! A one room apartment suitable for 3 persons ! For any information don't hesitate to contact us. We found Villa Duc excellent. The whole place is spotless and there is a daily cleaning service and very frequent change of towels. Eveline the manager was nice and lovely, all the reception guys were proffesionals and smiling, the room was perfectly clean, every day we came back to neat and tidy beds.